A young male must face two monumental announcements by his 70 something year-old father. One he is gay and two he has terminal cancer. "Beginners" is a touching dramatic narrative that is fragmented into a non-linear structure about a son, Oliver (Ewan McGregor) coming to terms with the loss of his father, Hal (Christopher Plummer). The 105 minute film is very personal to writer/director Mike Mills and feels as if the script was written after a number sessions with a therapist moving through significant moments and memories of his father. The drama bounces around from his father's coming out of the closet speech to his death bed while also splicing in a post-death arc following Oliver as he begins a romantic relationship with a actress named Anna (Mélanie Laurent). While all of these narratives do crash together throughout the film in its non-chronological format the film rarely loses focus on the heart of the story, mourning the loss of one's parents. 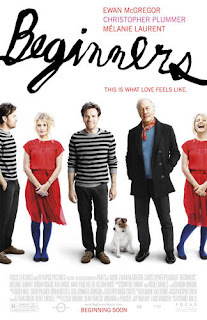 "Beginners" covers some pretty emotional territory but luckily writer/director Mike Mills knew when to mix in some humor to lighten the heavy material. One of the best examples of this is the adorable dog Oliver inherits after the passing of his father. Usually I'm not a huge fan of cute animals as plot devices, but in this case the dog Arthur, was authentically a huge help in Oliver's mourning process. What makes this interaction all the more different here is Arthur and Oliver communicate via subtitles. Well I should be more clear, Arthur communicates through subtitles. Oliver doesn't understand him in a Dr. Dolittle sort of way, but instead like how most humans pretend they are communicating with a pet. In any event, Arthur has some entertaining lines that help to put a smile on the audience's faces while trudging through some of the more emotional scenes. My only problem with the comedic tone is its balance. "Beginners" starts off pushing the humor noticeably, but as the film presses on the tone shifts to a more drama with only streaks of wit and comedic relief. Mike Mills was smart to add comedy to help balance out the emotional punches but if this film were a sandwich I'd say he didn't spread the humor evenly enough. The performances in "Beginners" really cement the meaningful weight to the story. Christopher Plummer in fact is the heart of the movie. He fills every scene with life and pulls the right emotions out of the audience the entire time. When you are suppose to laugh or when you are suppose to be somber, Plummer's portrayal of Hal gets the audience there. Plummer's performance is so seasoned, it would not surprise me in the least to see his name mentioned come award season for the Golden Globes and/or the Academy Awards. Ewan McGregor is no slouch either. McGregor delivers a steady portrayal of a man coping with some major changes in his life. His scenes with Plummer are spot on. The two of them actually feel like father and son. Most importantly Ewan McGregor moves the film along. There are a number of coming to terms scenes where Oliver recites and clarifies how things look in his head. Oliver is an artist within the film and these coming to terms or departmentalization sequences really help the audience to understand Oliver perspective on life and what he is coping with. They also come across as neat little bridge builders or transitions to different scenes. There is a motive and a progression to them and I appreciate the extra effort director Mike Mills went to put them in there. The one avenue in "Beginners" that really didn't work for me is the love interest Anna. Anna does not feel important to the film but more a distraction. I shouldn't say she isn't important because she is, she has a specific device in the film, but her character felt like an unnecessary aspect to an already heavy story. This also isn't to say that Mélanie Laurent does not give a quality performance as Anna, because she does. Her exchanges with Ewan McGregor are sweet and work in the confides of what Mike Mills is trying to accomplish, I just felt she was a deliberate plot device to spend time away from the father side of the story when I could have spent more time digging through the memories of Oliver's father. "Beginners" is a simple film that covers some heavy material. It is whimsical, passionate and smart when it needs to be. It is a brave film that feels extremely close to the chest of writer/director Mike Mills yet it is familiar enough that everyone watching will take something away from it. Its non-linear structure does leave the film feeling a little disjointed but in the confides of the story, memories are rarely pragmatic so it is easily rationalized away. Overall this a touching drama that I'd recommend any adult to see.